As the launch date edges ever closer, another photo claiming to reveal details of the iPhone 6 has appeared online. However, unlike previous photos, the owners of this handset said that the device is the finished model of the much-rumoured device - and it was 'smuggled' from an Apple manufacturer's factory. The design appears to fit with previous rumours of rounded edges and a larger screen, and the fingerprint scanner from the iPhone 5S also seems to make an appearance. The phone (pictured) was reportedly taken from Apple manufacturer Foxconn's factory in China by an ex-employee. 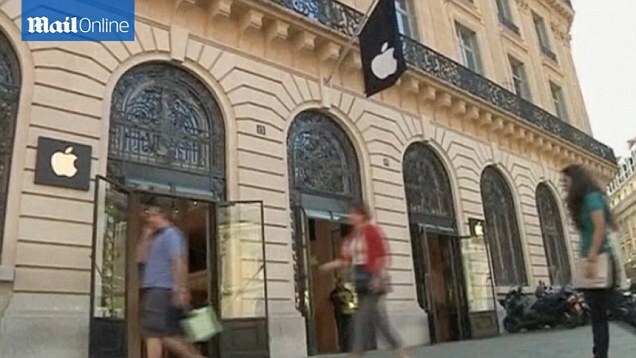 Apple is expected to launch its next-generation iPad and iPhone models at an event in September. Analysts believe Apple is working on two versions of different sizes for its iPhone 6, with one being 4.7 inches (11.9cm) diagonally - the same size as the HTC One. The iPad Air is 20 per cent thinner than previous models, and Apple is expected to launch an equally super-thin iPhone, dubbed iPhone Air. This is expected to be the smaller of the two handsets. The phone's slim design and raised screen also match with previous reports. Last week, Russian designers posted photos which they claimed were the phone's casing. They show a protruding camera, for example, which was first reported on in April, recessed volume controls, which were hinted at during the start of the month, and an embedded logo. 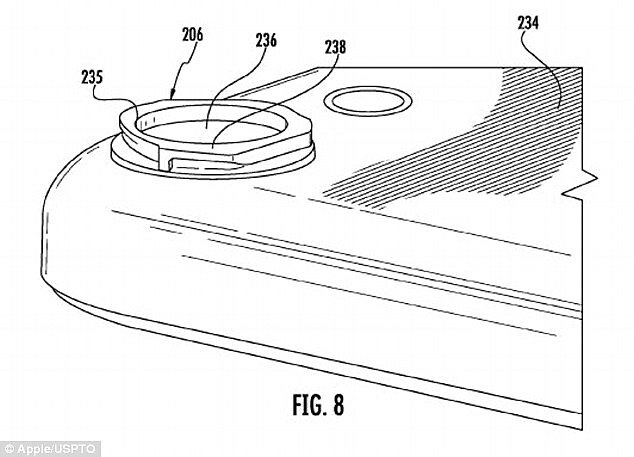 The image is a close-up shot of this camera ring, and could be used to attach additional lenses to the iPhone 6, as suggested in a patent also revealed in April. Elsewhere, the recessed volume controls on Feld and Volk’s image are similar to those seen on the leaked images of the iPad Air 2 earlier this month. It is likely that if Apple chooses to make a tweak, such as this, to one new flagship device, it will appear on both. 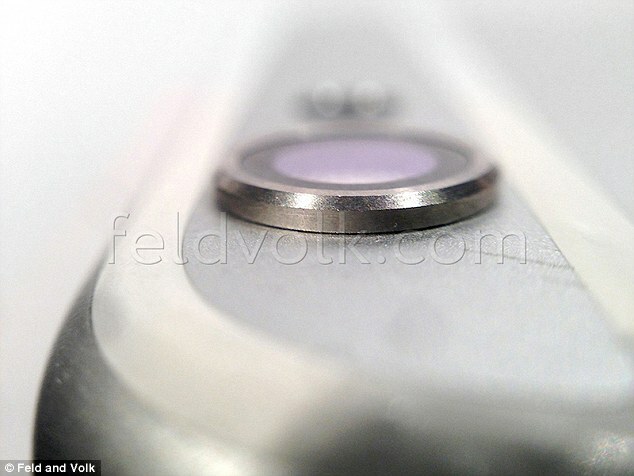 Another image taken by Feld and Volk shows an embedded Apple logo that the designers claim is scratchproof, and made of Liquidmetal alloy. Liquidmetal is a super-strong material that can be moulded into shape. The phone's slim design (pictured) and raised screen also match with previous reports. 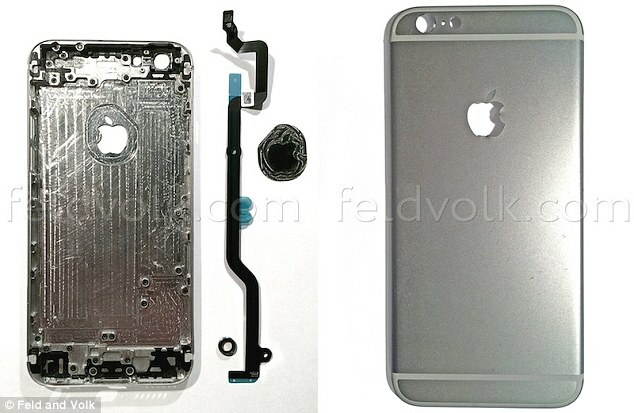 Finally, a cable seen next to the casing for the rumoured handset is believed to be for the home button. iPad Air 2 earlier this month. IPad sales slumped 9 per cent in the last quarter, according to the tech giant’s latest earnings report, amid reports demand for the technology is waning. Apple iPhone 6 Pics -- Drool, Geeks!